As part of our Coach Education initiative we are asking clubs to provide Young Whistler (underage Referees) for all our under age games, U7 & U8 Monster blitzes, U9 , U10 & U11 League Games. For clubs hoping to achieve Silver or Gold Benchmarking it is part of the criteria that must be followed. 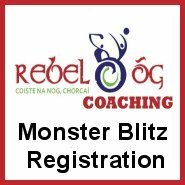 In 2016, Rebel Óg Coaching expanded their Monster Blitz program to include individual matches at U10 level. In 2017, this league expanded to U9, U10 and U11 matches. This will continue for 2018. Over any given weekend, up to 156 matches take place in the u9, u10 and u11 leagues, as well as numerous matches in the U7/8 Monster Blitzes. To cater for this and continued expansion of the leagues in coming years, there is a need for a recruitment drive in referees to cater for these underage Go Games matches on a weekly basis. We are proposing a Referee Pathway, that all young referees should follow in the process of becoming a Full Qualified Referee for the Cork County Board. 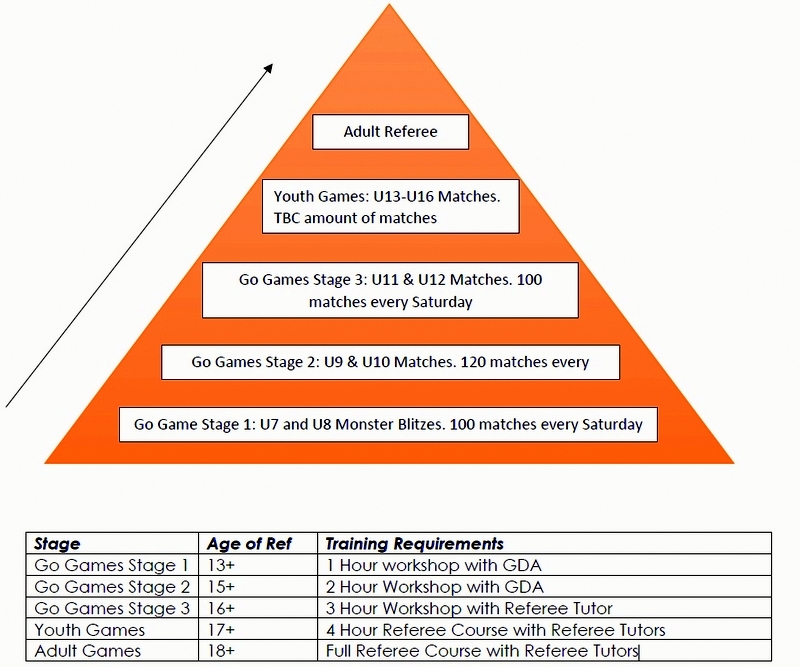 Ideally, Referees will begin at Stage 1 and gradually work their way up to Adult Games over several years. The process will be monitored by a Referee Coordinator within each club. At Go Games Stage 1&2, the referees will only referee matches for their home club. From Go Games Stage 3 onwards, Referees will no longer referee their own club matches but will be designated to neighbouring club matches to be a neutral referee. Games are 20 mins long (10 mins per half) 1st Game-10.15am, 2nd Game – 10.45am and 3rd Game –11.15am. The rules are the basis for every game however if, and only if 2 teams agree, they may change a rule for that game only. Language from sidelines to be encouraging and polite at all times. Clubs to supply young referees where possible and adverse comments from the sideline towards these referees is not allowed. Players must have Helmets for hurling and Gumshields for football. Referees: Every club is obliged to supply trained young referees for their home matches, so it is crucial that these referees are coached and mentored like the players in their development. Abuse of referees will not be tolerated and each club will be held accountable as per the guidelines of Rebel óg (Coiste na Nog Regulations 2016). We will hold training workshops for all referees before the league starts. It is imperative that each club has a young referee on hand for their home matches e.g. 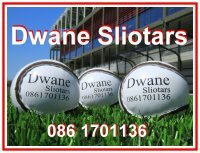 Douglas 3 teams are hosting Midleton 3 teams, Douglas need to provide 3 referees for the matches. So, Douglas will need to have at least 3 referees at the training Workshop. 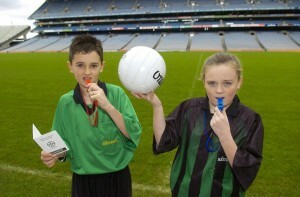 We would recommend that these referees get €10 from the home team for refereeing the match on the day. o Player may solo the ball for a maximum of 8 steps.